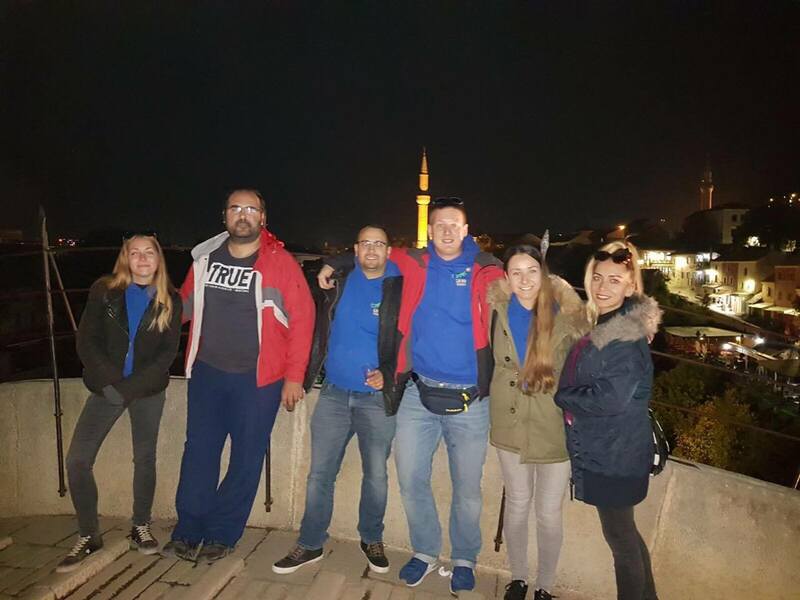 Following a long but wonderful and exhilarating season, certain members of the Gecko team decided to take a short trip east and let their hair down in Mostar, Bosnia (BiH) (well, those who have the hair!). As always, whilst we may have left our tour badges at home, we all know there’s no such thing as a free lunch so our minds are set on how we can nuance next year’s Gecko trip to Mostar so as to enhance guest experience. This time the Gecko Tours van isn’t filled with buzzy, care free and excited guests -instead it’s filled with some deserving (and equally buzzy) members of the Gecko Team (Andreja, Ina, Rina, Baldo (me), Boris, Duje). We’ve brought along our friend – geography professor Ivan Relja, no less!! – just for the ride – he’s one of the most ardent world travellers in Split so that gets him a seat in our bus as far as I’m concerned! From Split to Mostar takes about 2 and a half hours (the regular public bus takes ~ 4 and a half hours) so that’s a decent speed and we’re not busting any speed limits to get there. Up until the BiH border we drive on a virtually new and empty Croatian highway, quick, smooth and inexpensive. Through the border post (showing our passports) we’re on a small but perfectly formed highway – the road requires a small toll payment (they take cash of card). 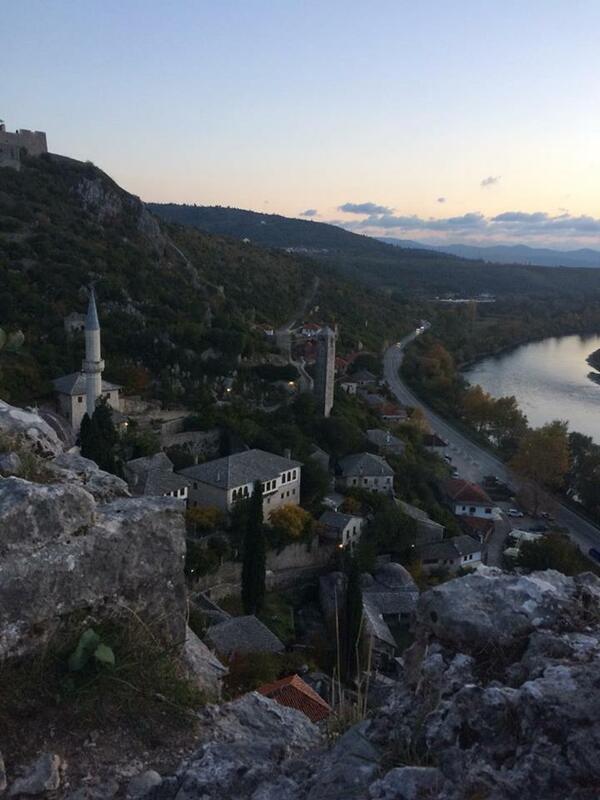 Onwards… within about an hour of the border, we’re on the edges of the fascinating City of Mostar! In Mostar, our lovely hosts from Zigana apartment are waiting for us “weary” travellers. The apartments are clean, tidy and just a 10 min walk from the famous old bridge. 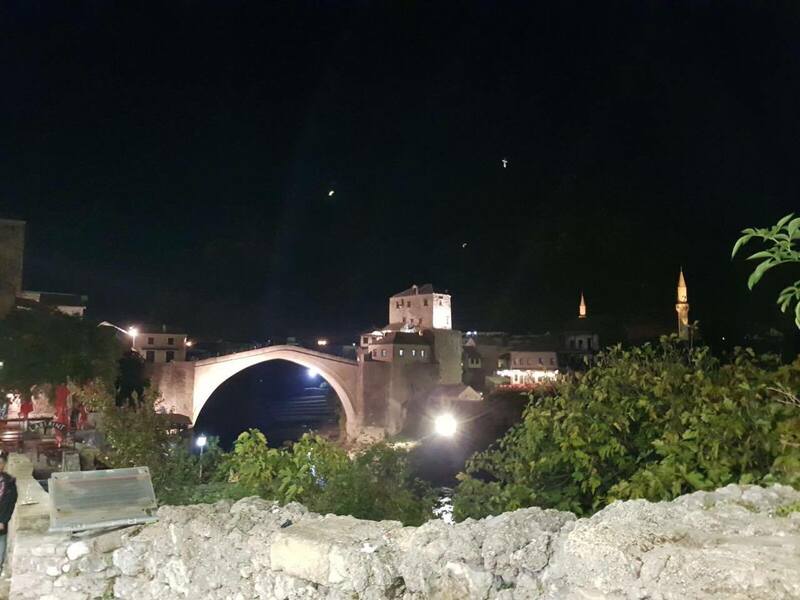 We drop our luggage, take a shower (some of us … haha), and head to the old part of Mostar. The first stop is the restaurant- bar Niđe Veze Bar Nid. We enjoy a couple of craft beers and we order “nargila”. 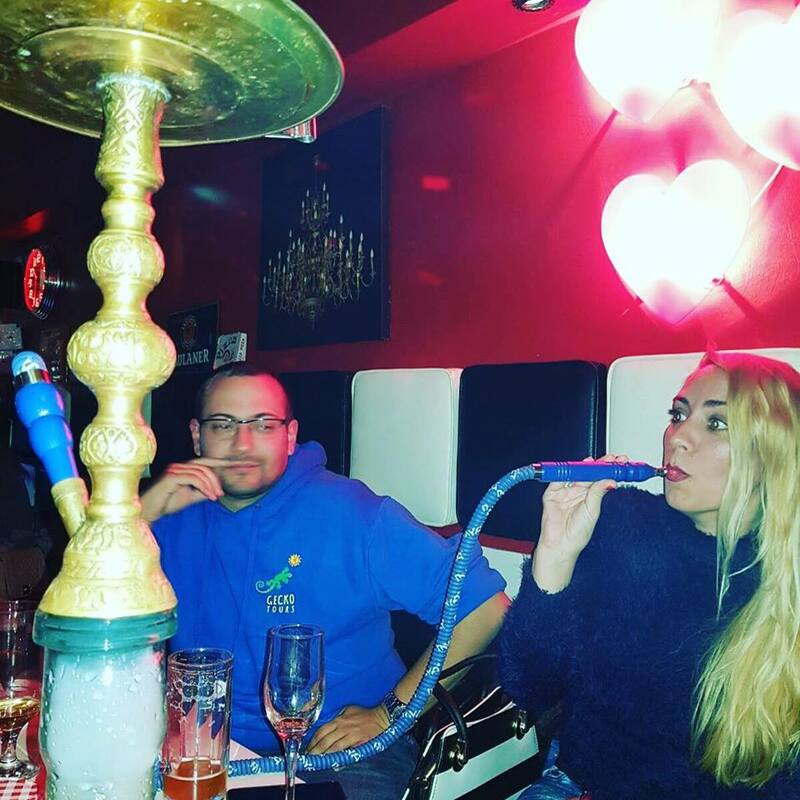 The shisha pipes are out and we set into 2 little cubes of peach smelling tobacco. I’m not a smoker but I give it a go – I’m not convinced – it takes 2 hours to get through a pipe’s contents so we need to move on! We proceeded to the Black Dog pub Black Dogwhich was certainly more than we expected. With a great choice of Bosnian and international beers we particularly enjoy the Dudov Svilac blend from Opuzen. Fortified by the beer, we all get very talkative, we meet local band and frontman Dutka who tells us he lived in Split for 3 years. We all invite Dutka to look us up when next he’s playing in Split. Next up its the owner of the pub, Stephen Long, the guy is from the US and he came to Mostar during the war and decided to live in BiH. He’s been the manager for 4 years and focusses on giving local groups and up and coming groups a chance to ply their art – in the summer he has an act on 4x a week. With the last round of Livanjsko pivo (a local tipple) consumed we bid Dutka and Stephen farewell. After all, there’s no such thing as a free dinner, this is semi work (that’s what I tell them anyway), so it’s time to go to bed! Feeling a little “tired and emotional” in the morning we look for some respite through the healing properties of a strong coffee and a plentiful breakfast – it does the trick! 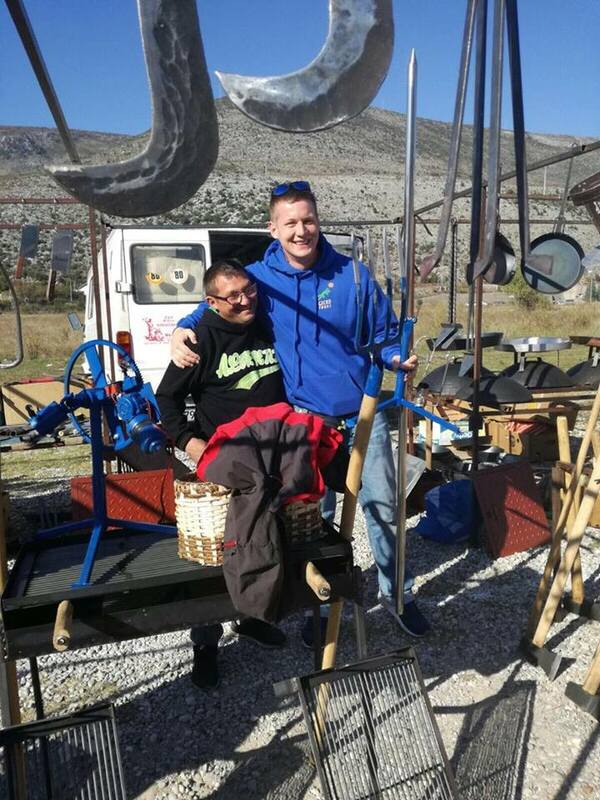 A democratic decision is reached on our itinerary – we’ve decided to visit the fair in Vrapčići (10 km away from Mostar), then take a quick trip to an abandoned Partisan WW2 cemetery (they always hide fascinating historical gems in cemeteries we all agree! ), and then attempt to reveal all those other details of the old part of the city that are not necessarily visible to passing visitors but that we would like to bring to the attention of Gecko guests. We’re on a mission! We drive about 15 minutes to the fair in Vrapčići, not knowing what to expect – this, after all, is the recommendation of our previously mentioend travelling geography professor – Mr Ivan Relja – no less! Its a fascinating place – people from all around are selling their wares and produce. You can buy just about anything, local flowers, local antiques, pins, badges, various memorabilia, agricultural goods (new and old), you can eat, drink and exchange pleasantries with the locals. We go for just 30 minutes and emerge, some 3 hours later, carying bags of all sorts. We all agree, if we take Gecko guests here on our Mostar day tour we need to manage their time very carefully! 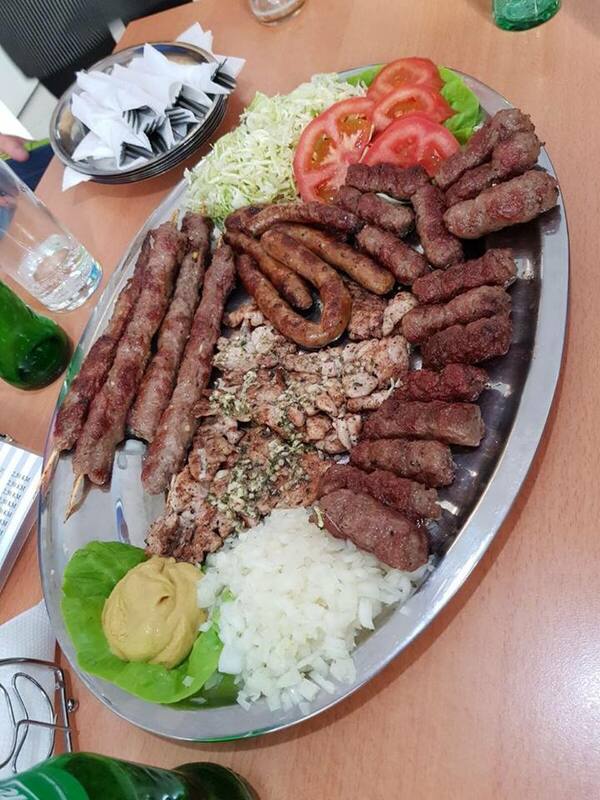 All this shopping has made us hungry – we head back to Mostar to eat a plate of ćevapi (if haven’t eaten cevapi you’ve never experienced BiH!). Then it’s off to the Partisan cemetery – all around graphic evidence of the long running and intense fight for liberation by the Yugoslavian antifascists against the Nazis in WW2. It’s just 10 minutes from the epicentre of Mostar and well worth a visit for anyone, even those with a limited interest in history. Darkness is taking over now … so we navigate ourselves to the old part of the City. We challenge Boris to show us how he did the Mostar Gecko tour this season. His Trip Advisor ratings were great so its tempting to pull his leg and say he got lucky. 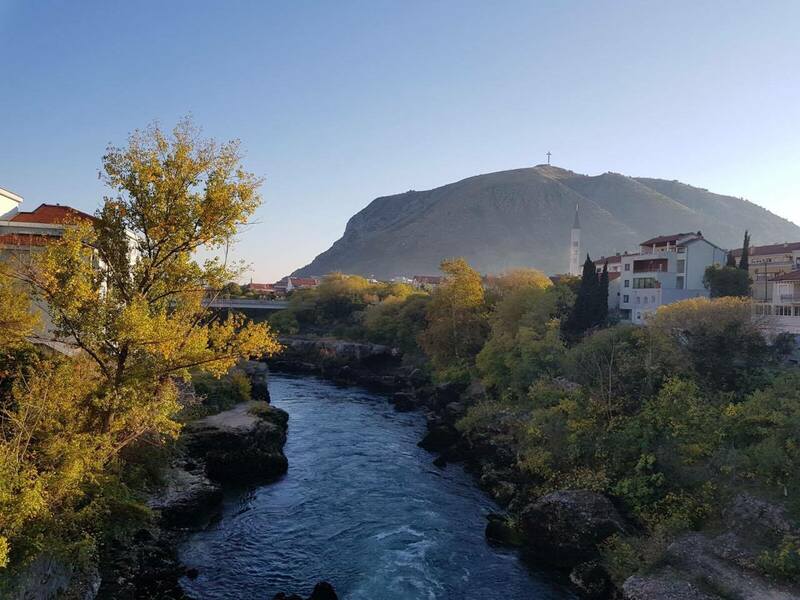 Ina throws in a few suggestions from some of her Mostar tour experiences too. Im making notes! The conversation meanders into bridge construction, the Mostari (the historical keepers of the bridge), the 90’s in Mostar, and Mostar’s part in the fall of Yugoslavia. We all agree, Mostar is really a microcosm of ex-Yugoslavia. Its a city full of differences and a rich and varied culture, especially the eastern part of the city. We walk under the bridge and think how brave you must be to jump from the 27 meters high bridge. We cannot agree how much money you would need to be given to jump but we can agree that we wouldn’t jump for less than EUR 150,000. In the summer, guys jump from the bridge everyday – rather them than me (in case anyone would like to take me up on the challenge!). We visit the photogallery of Wade Goodard – a guy from New Zealand who worked as a Reuters photographer. His photos of war torn Mostar and life in Mostar under the siege are a poignant reminder of the hard times the City has endured – we leave suitable message in the guest book. The pub calls – we’re off to Shankly’s pub Shankley’s where the locals convince us that in Mostar, at least, Liverpool fans will never walk alone!! Like the night before, we rekindle a passionate thirst for the local beer and so the night becomes a little more obscure – remember, no such thing as a free dinner – we set the alarm clock to be ready for 9:00 AM. We drive to Blagaj Tekija alongside the river Buna – beautiful nature and scenery all around – see this Forbes. There’s a small entrance fee to the park but it’s well worth it for all the beautiful flora and some fauna. 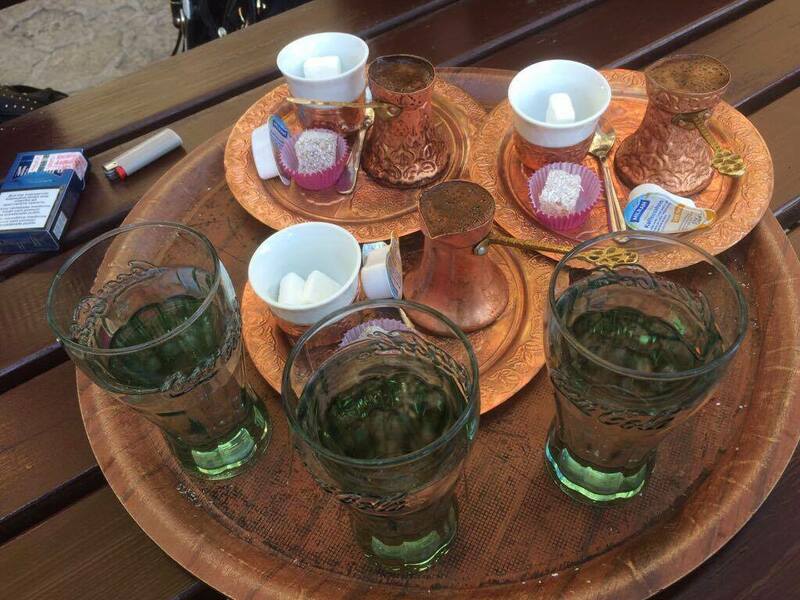 We sit on the beautiful terrace and drink the great local sugared coffee (think Turkish coffee). A fascinating village for anyone visiting the area. 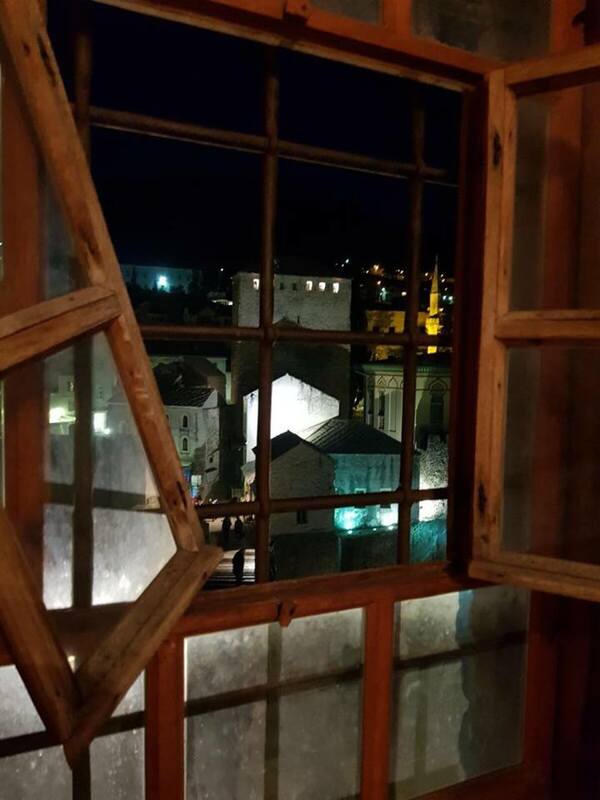 We have called in on Počitelj for the last 2 years as part of the Gecko tour to Mostar and our guests love it – a genuine hidden gem. 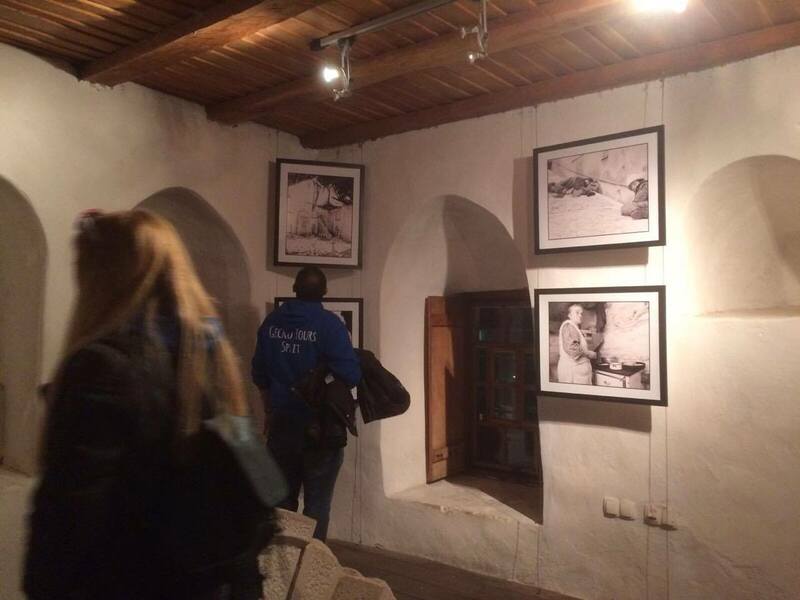 Ina and Boris take us across to the Gavran Kapetanović house with its amazing art collection, the mosque of Ibrahim Paša and to the tower-fortress. Our tour lasts 45 minutes and we get around Počitelj entirely – not to be missed. Our greatest triumph is that we have fitted this whole experience in in just 2-3 days – it’s been GREAT! My appreciation to Ina and Boris – our Mostar experts – who made the experience so rewarding! I’ve set them the challenge of combining all this new-found idiosyncratic knowledge (and of course the traditional Mostar bridge shopping experience) into the GREATEST one-day tour of Mostar EVER!! They say they can do it so watch this space for next year. Time to head back to Split – we’ve got work on Monday!! Its back to being guides, hosts and not guests but hey ho … that’s why we are SPLIT’S NO 1 SMALL GROUP TOUR SPECIALISTS!